Every year I make my own evergreen garland for the staircase, made of holly, ivy, conifer and lights. Now I am the least artistic person in the whole wide world. 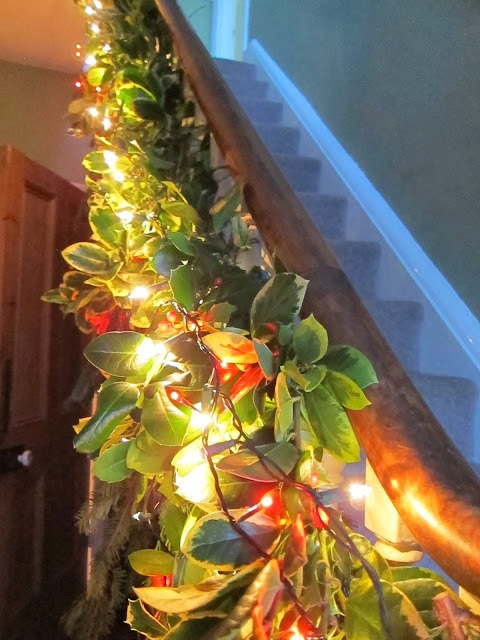 I can't paint or draw, but the joy of the garland is that ANYONE can do it. And I mean anyone. You need a length of wire to begin with, and I have used the same one for over ten years. 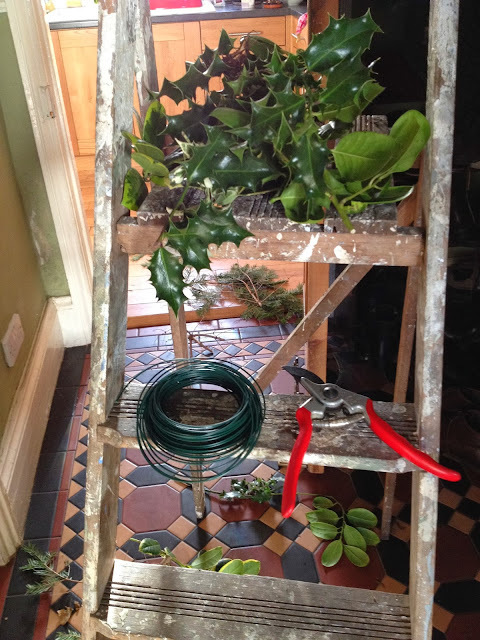 After that, you just need patience, a barrowful of greenery and lots of green, plastic covered wire. Once the initial wire is firmly secured, I build up the greenery in layers. It is very forgiving, and not a precise science at all. I start with the base layer of conifers, or the bottom branches cut from the Christmas tree. The thin branches are tied at the base and hung vertically - the longer and more ample they are, the better. Once the base layer is completed, the next layer is holly, and I usually suspend it vertically too, overlaying the conifers. 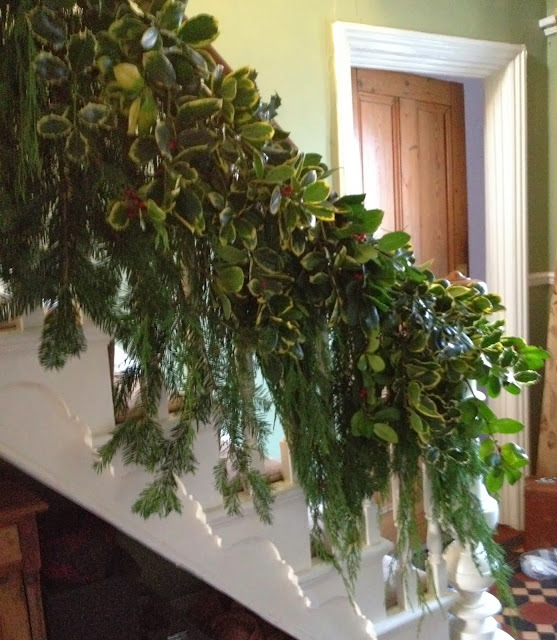 The next layer is holly and again, more holly, but this time it is tied in horizontally so that it covers and hides the tied in tops of the previous layers. I usually drape some ivy along the very top. Lights are added as a final touch, sometimes white, sometimes red - this year both red and white. 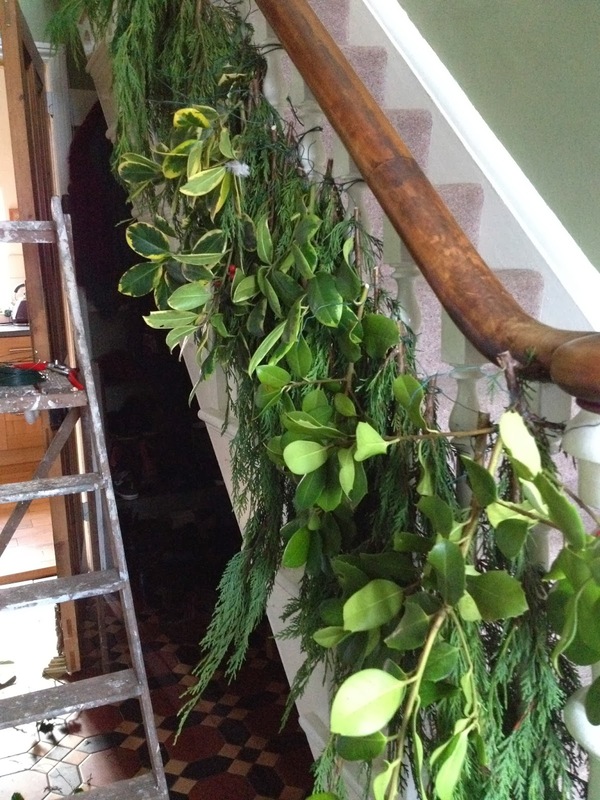 The garland doesn't last very long, ten days maximum, as it dries out in the central heating. It lasts much longer if it is freshly cut. Cut on a dry day and store somewhere cool if rain is forecast. The worst is dismantling it after Christmas, when endless patience is needed to untie all the wires ! The dying greenery can all be shredded and composted, and the gathering of the greenery is a good opportunity for some timely pruning. 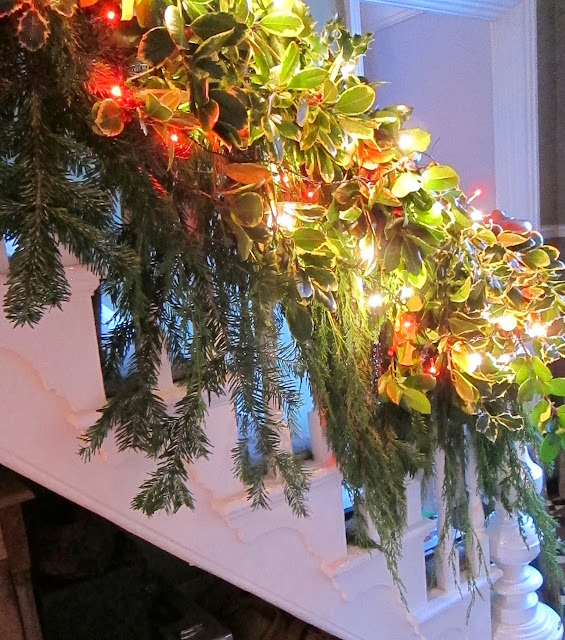 The trick to a successful garland is to make it as full as possible, and to try to get some length in the conifer branches, to give the whole thing some impact. Beautiful! A Very Happy Christmas to you too. Thanks Rusty Duck, now nursing sore fingers from the holly !Happy Christmas to you ! Your garland looks terrific.I haven't seen branches cascade like this before and think it looks quite wonderful. I like that you mixed holly in with the evergreens. It adds that extra level of interest. Happy holidays! Hi Jennifer, thanks for your kind comments. Have a happy holiday too ! Hello Jane. I always prefer natural decorations and I think your garland is beautiful. Happy Christmas! 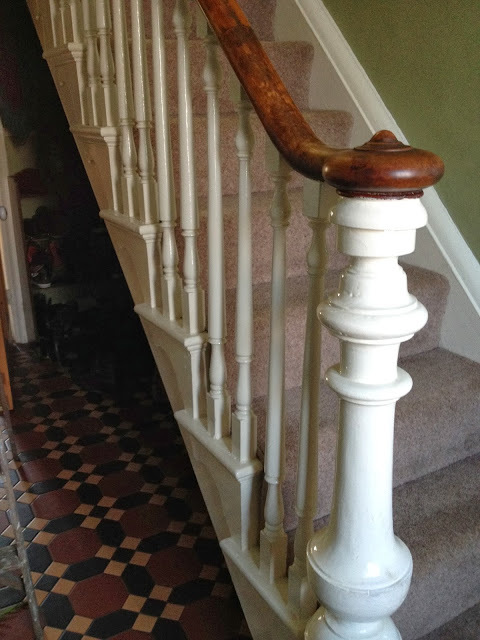 I wish I had a staircase like yours. Your natural wood doors are very attractive too. Regardless of our lack of a suitable banister we hauled in fresh greenery. I'm with you on the satisfaction of creating something with it. Yours looks good enough for a classy decorating magazine. Warmest wishes of the season to you. Hi Susan, a Peaceful New Year to you and yours. Thanks for kind comments. 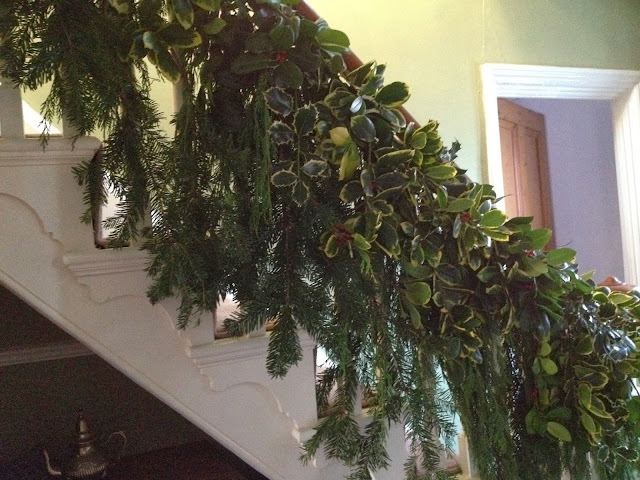 The garland is now beginning to turn up its toes, and my tigers are beginning to itch to take it down. A very fleeting pleasure, but worth the effort ! That is really pretty! I don't have access to all that fresh greenery since most of my trees/shrubs are deciduous. But you've given me ideas for next year since garlands can be purchased locally. :o) Happy New Year! Hi casa Mariposa. A happy and peaceful New Year to you and yours ! I didn't realise that you could buy garlands ! I thought that they were all DIY !! Aw thanks Dee. happy New Year to you! that looks glorious! My Swiss MIL used fresh greenery to decorate for Christmas. One or two attempts convinced me, that it is futile to attempt here. I was delighted when I found a glass Advent wreath in Switzerland. Then I can use fresh green, and repeat as needed. My wreath for the front door is dried and permanent. Hi Diana. Climate is a great decider as far as fresh evergreen decoration goes ! The glass wreath sounds like a fantastic compromise between fresh and permanent. 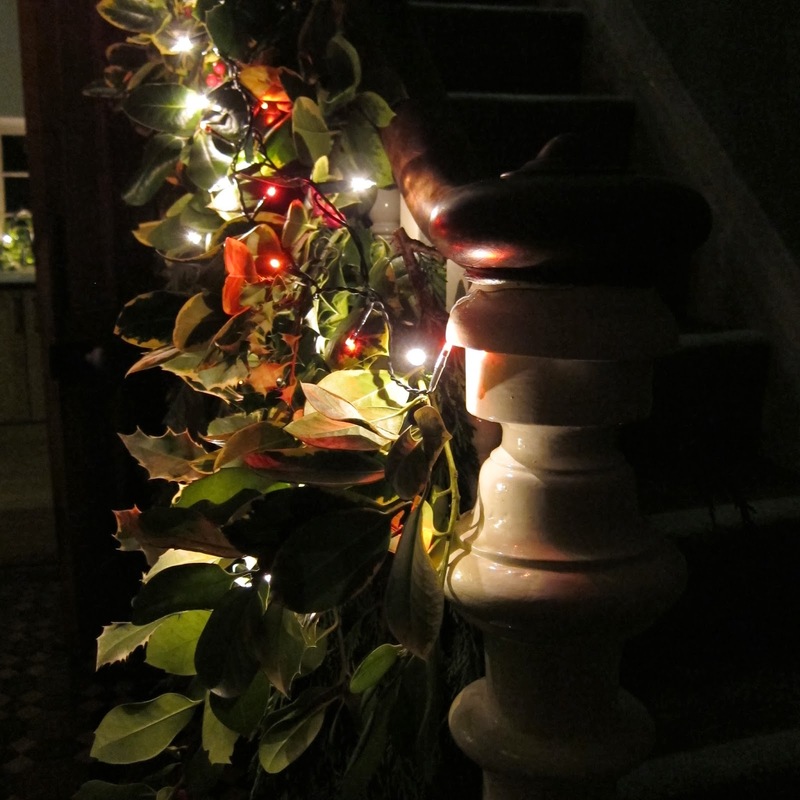 What a gorgeous garland, love how it hangs low and doesn't interfere with using the railing. The variegated holly is a really nice touch too. Hope you had a wonderful Christmas and all the best to you in the new year. I like this very much. I tried to make a wreath for the door once and it didn't last a week! I will keep this in mind for next year and possibly give it a go. All the best to you and yours in the New Year!